Nancy 3. 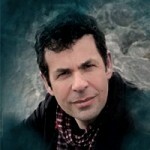 Hoffman is a classically trained pianist and works nationally as a music theater director. Nancy 3. 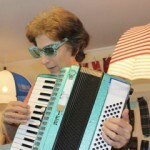 Is a founding member of The Casco Bay Tummlers Klezmer Band, (http://www.cascobaytummlers.com/) playing Eastern European Jewish folk music for over 30 years. She brings her love of this music to spice up the mix at Fiddle Camp. 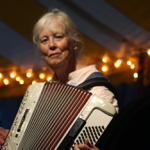 She leads The Maine Squeeze accordion ensemble, playing international folk music. Her solo work includes international cabaret and her one-woman rendition of Gilbert and Sullivan's operetta The Mikado. She is also director and curator of the world's only Umbrella Cover Museum. Nancy 3. lives on Peaks Island and migrates to Key West, Florida for the winter. Her middle name is really 3. 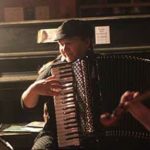 Sabin Jacques began playing the accordion at age 14, deeply influenced by such musicians as Simard, Bruneau, Labbé Messervier and Montmarquette, he sought his originality in his unusual technique which gives him, as a left-handed player, a recognizable signature. Originally from the beautiful Gaspé peninsula, Sabin lived in Montreal between 1992-2009. This cosmopolite musical community allowed him to make significant acquaintances with musicians in the popular and commercial music domain. 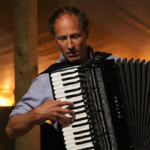 Sabin remains profoundly attached to his traditional roots and regularly takes part in pedagogical projects, teaching at camps such as the Leahy - Natalie MacMaster camp (ONT) and Ashokan (NY), to name a few. 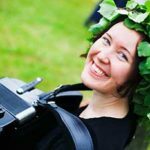 Since distance is not an obstacle for learning, Sabin teaches accordion at home through internet or weekly at the Maréemusique School of Traditional Music. His teaching is said to be uplifting and always inspiring. His most recent recordings (2007 and 2010) present traditional tunes from Quebec played through remarquable arrangements, with his fellow musicians from band Tidal Wave / Raz-de-marée, putting a highlight on his stunning technique and musicianship while confirming his status as one of Quebec's leading master accordionists. Here’s the link to the Maine Fiddle Camp page which has more general information and, most importantly, information on how to sign up!